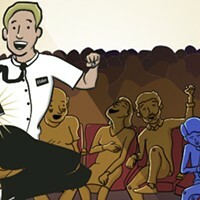 The success of The Book of Mormon all over the country—from Tony Awards and Broadway success to its touring productions—has shown that it’s not just about us, of course. The gleefully crude show by Avenue Q composer Robert Lopez and South Park creators Trey Parker & Matt Stone—following eager young Mormons Elder Price (Billy Harrigan Tighe) and Elder Cunningham (A. J. Holmes) on their challenging mission to Uganda—offers up plenty of catchy songs and hilarious punch lines that transcend cultural specifics. Of course, it’s a show that steps up to the boundary of good taste, takes a huge crap on that boundary, then runs naked and swearing several miles past it. There has never been anything sacred in the Stone/Parker universe, and if that means mocking the Joseph Smith story, or portraying a particularly undignified place where a Ugandan warlord has shoved a Book of Mormon, so be it. 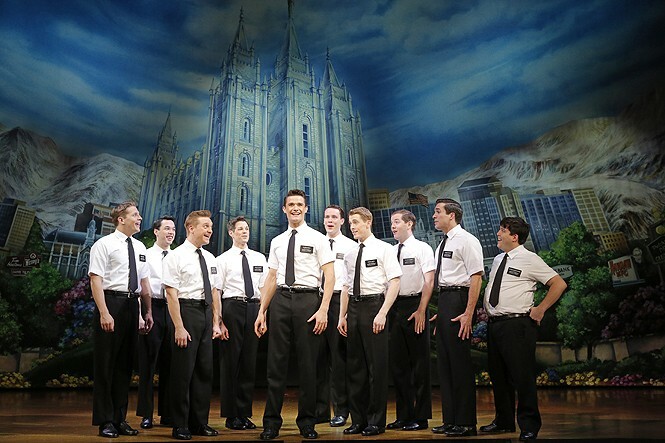 But even as the show turns specific LDS doctrine into the comedic lyrics of “I Believe,” it’s also a unique celebration of the power of religious stories—no matter how ridiculous they might seem—to bring comfort to people’s lives. The Book of Mormon may cast a more-than-slightly skeptical glance at religious imperialism and the idea that any belief system is a panacea—the show’s brilliant final lyric punctures that notion—but it actually provides an alternate perspective on what a missionary might accomplish. Salt Lakers are far from the only people who might find that notion delightful, even if certain jokes are bound to hit far closer to home.